Contact Tony now for more information about music, sound, lights, staging and your free quote. 2. sing and play songs from 1930s Hollywood movies that was piped live into their Tiffany and Co., Dior, Louis Vuitton, Bvlgari, Ralph Lauren, Fendi, Omega and Loewe, Coach, and Burberry gallery outlets as guests shopped. It’s not only Greg’s authentic 1920s – 30s singing and excellent swing musicians that keep corporate clients entertained. It’s also Greg’s masterful stage presence. With over twenty years on stage, and in film and TV, (working one-on-one with four Academy Award winners), Greg ensures everyone feels included. There are always plenty of individual and group photos taken with Greg on the night. 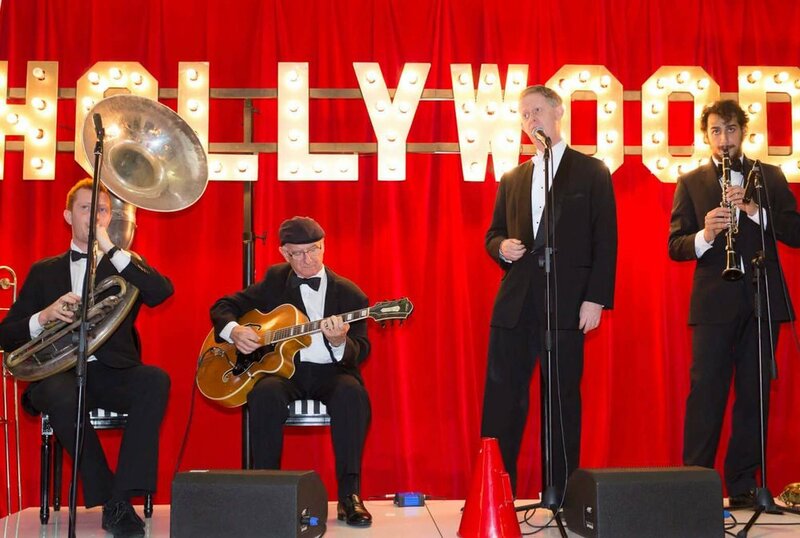 The six-piece Greg Poppleton jazz deco band had 550 guests dancing at the huge end-of-year celebration. Sound, staging and lights were supplied with the band by Tony Jex. This one stop A/V shop deal when you book Greg Poppleton saves you time and money. It guarantees you perfect sound and ambience every time. The band's swing dance partners gave an exciting, acrobatic swing dance exhibition. They danced to three songs by Greg Poppleton - Exactly Like You, Five Foot Two Eyes Of Blue and Walkin’ My Baby Back Home. The band's swing dancers were also commissioned to give staff members six weeks of dance lessons leading up to the event. This was to practice two mass choreographic routines to develop departmental bonding and which were a highlight of the night. The routines were danced to songs from two of Greg Poppleton's albums. First, the balboa group danced to Greg Poppleton’s ‘The Charleston’ from his ‘Doin’ the Charleston’ album. Then the Lindy Hoppers hopped to Greg Poppleton’s ‘It’s Only A Paper Moon’ from his 2006 album, ‘The Phantom Dancer’. Have Australia's only authentic 1920s - 1930s singer Greg Poppleton and his band to Orchestra at your event. We can add swing dancers, dance lessons, sound, lights and staging. Just add what you want in the message section of the contact page. It's the premier Sydney event for the NSW Rail Museum - 'Where Rail Heritage Comes To Life'. The NSW Rail Museum operates steam train rides through the city from Central as part of a fantastic nostalgic long weekend event for families and enthusiasts. In 2017, the Museum booked Greg Poppleton to play 1920s-30s music from 10am - 2pm every day during the event to enhance the vintage experience. It wasn't the first time the Museum had booked bands for this event. What happened when they booked Greg Poppleton? It was the perfect fit. Greg drew crowds. For the first time people stopped to enjoy the music that had been hired. Greg's 1920s - 1930s jazz deco swing and high energy stage style added real complementary entertainment value to patrons of all ages. So, in 2018, Greg Poppleton was invited back to play another three days at the Expo. We even had a woman run up to us and place a long-stemmed rose in my 1920s megaphone. Here's a picture of my son, Damon, holding it. He was playing alto sax in the Greg Poppleton band that day. The point of this story is: book the right band to make your vintage, heritage, 1920s - 1930s theme a success. Greg Poppleton is Australia's only authentic 1920s - 1930s singer with over 1.2 million total YouTube views. He is the most listened to Australian jazz singer without radio or TV support. Greg Poppleton plays as a trio to full 1920s Orchestra. Want Glenn Miller? We can do that, too.